ICW Releases New Double Elite Ceiling Mount | ICWUSA.com Inc.
Sleek design and sturdy construction. Engineered for years of reliable service. Optional sliding mouse tray (LUS mouse) can be pulled out to left or right side. Generous size fits most laptop computers. Space-saving profile. Ergonomic Laptop tray adjusts to positive, neutral, and negative tilt for maximum ergonomic benefit. Stows just 6 ¼” (15.9 cm) from the wall on an Ultra arm. 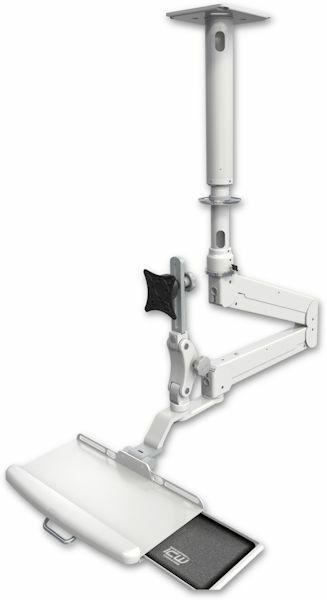 Mounts to most ICW mount configurations. Available in options that mount to the wall, on a wall track, desk, or pole mount. The LP6220 has a load capacity of 30 lbs (13.6 kg) and 22 lbs (10 kg) with keyboard and monitor mount. Its stowed depth is 14″ (35.6 cm) from its drop pole base and has an arm swivel of 180° at the mount (stop pins provided). The keyboard tray tilts 6° up (positive) / 11° down (negative) and swivels 240°. Its diameter of motion is 68″ (172.8 cm) and has a vertical range of 38″ (96.5 cm). Click here for more information or call 1-800-558-4435 and speak to a sales representative.